On 10 May 1940, the German army invaded the Netherlands. It was the start of five days of fighting that resulted in the occupation of the Netherlands. Why did Nazi Germany attack the Netherlands? How did the Dutch population respond? What happened in those five days? On 1 September 1939, the German army invaded Poland. Two days later, England and France, both allies of Poland, declared war on Germany. The Second World War had started, but after the German occupation of Poland, there was no fighting for some time. This period was called the ‘Phoney War', because it was clear to all parties that things would not end there. In 1940, the principle of Dutch foreign policy was neutrality, as it had been for a century. The Netherlands had avoided getting involved in international conflicts and would only take sides when attacked. The strategy worked fine during the First World War. The Netherlands remained neutral and the war passed the country by. The Dutch government was therefore careful not to take an official stand on the situation in Nazi Germany. It did not want to give cause for hostilities. This resulted in some awkward situations, with Dutch people who criticised the politics of Adolf Hitler being prosecuted for insulting a 'friendly head of state'. The planned attack on the Netherlands was part of a larger plan of attack, of which the code name was Fall Gelb. The goal of the Germans was to conquer France. They wanted to bypass the French defence line at the eastern border by going through the Netherlands and Belgium. Their occupation of the Netherlands would also prevent England from setting up a base of operations on the European mainland. Germany planned to defeat Belgium, the Netherlands, and Luxembourg by catching them off guard in a swift attack, the so-called Blitzkrieg. The Germans used espionage to discover the weak points in the Dutch defence. Some German officers dressed up as tourists to map out the area, and they also received information from Germans living in the Netherlands. But not all German preparations were running smoothly. The Belgian army got hold of the German attack plans when a German aircraft made an emergency landing in Belgium in early 1940. Hitler decided to postpone the attack. Subsequent bad weather conditions caused the attack to be postponed several times after that. Meanwhile, the Dutch government had begun to anticipate a German attack. Soldiers were kept in service for a longer period and all leave was cancelled. On 19 April 1940, the government even proclaimed martial law. This allowed them to censor sensitive military information and to arrest persons who were considered a risk to national security. It was feared that Dutch NSB members, for instance, would help the Germans in the event of an invasion. The Dutch population was unaware of most government measures. Although the military activities were visible, war seemed a long way off. The government tried not to raise the alarm and called on the population to ‘stay calm' and ‘quietly focus on their normal activities'. On 10 May 1940, German paratroopers land in the Netherlands. In the early morning of 10 May 1940, Dutch observers saw bombers from the German Luftwaffe flying in the direction of the North Sea. They assumed that they were on their way to England. Once over sea, the planes made 180-degree turns and flew back to attack the Netherlands. The Netherlands was at war. Hitler justified the attack with a lie in an attempt to influence public opinion. He claimed that England and France had been planning to attack the German Ruhr Area via the Netherlands and Belgium. 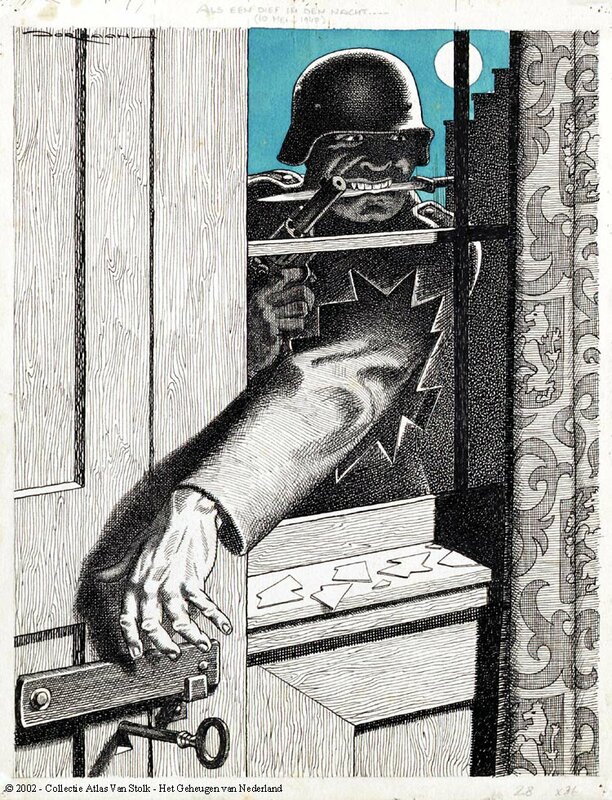 Some German soldiers were therefore surprised when they never encountered any English soldiers in the Netherlands. Many Dutch people considered the German invasion a cowardly act. Drawing of the invasion by L.J. Jordaan, 1945. Collection: Geheugen van Nederland / Atlas Van Stolk, Rotterdam/ artist: L.J. Jordaan. Bombers attacked the military airfields and barracks around The Hague. 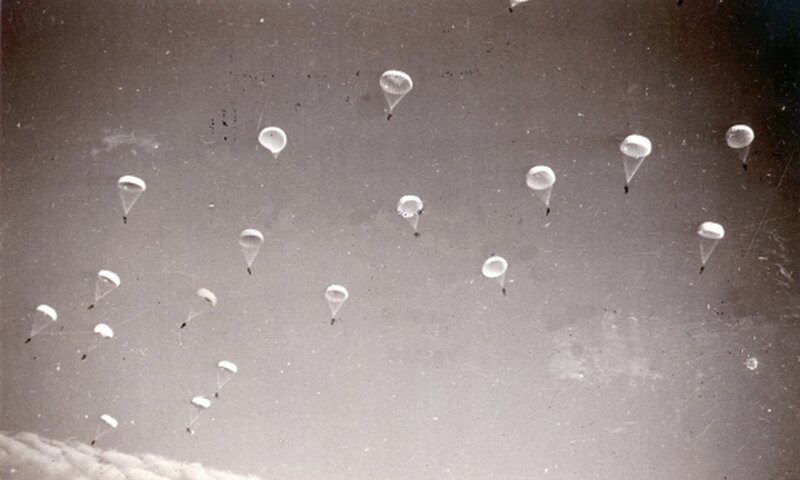 Paratroopers descended and German planes dropped soldiers, who hoped for a quick victory by taking Queen Wilhelmina and the government hostage. The plan failed thanks to the fierce opposition of the Dutch soldiers and blunders made on the German side. The German armies also attacked the Netherlands in the south. There, Dutch troops blew up bridges to slow down the German advance. This did not always work out. Wehrmacht soldiers used a trick to conquer the strategically important Gennep railway bridge: dressed in Dutch uniforms, they overpowered the Dutch soldiers. On the Grebbeberg, the Dutch army held out against the German army for three days. This line of defence consisted partly of flooded land. It temporarily slowed down the invaders. Even so, the Grebbe Line fell on 13 May. The Germans advanced ever further. Although the Dutch army still gained small victories, it could not hold its positions. The Cabinet felt that Queen Wilhelmina should flee. Her safety was at stake. Initially, she did not want to go, but she was forced to leave when the situation worsened. A warship took her to England, where the British King received her. The fact that their Queen had fled, came as a blow to the Dutch population. Until then, the newspapers had mainly reported on Dutch successes. The situation turned out to be more serious than expected. Some people criticised the Queen for fleeing and called her a coward. However, during the occupation, the Queen would prove to be an important symbol of the fight against Nazi Germany. 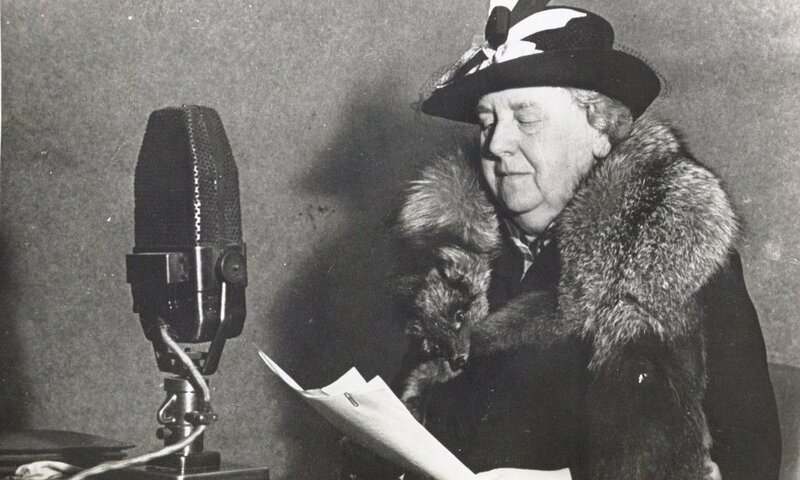 From England, Queen Wilhelmina makes every effort to support the occupied Netherlands. Here she addresses the Dutch population on Radio Oranje. The Queen was not the only one to flee. 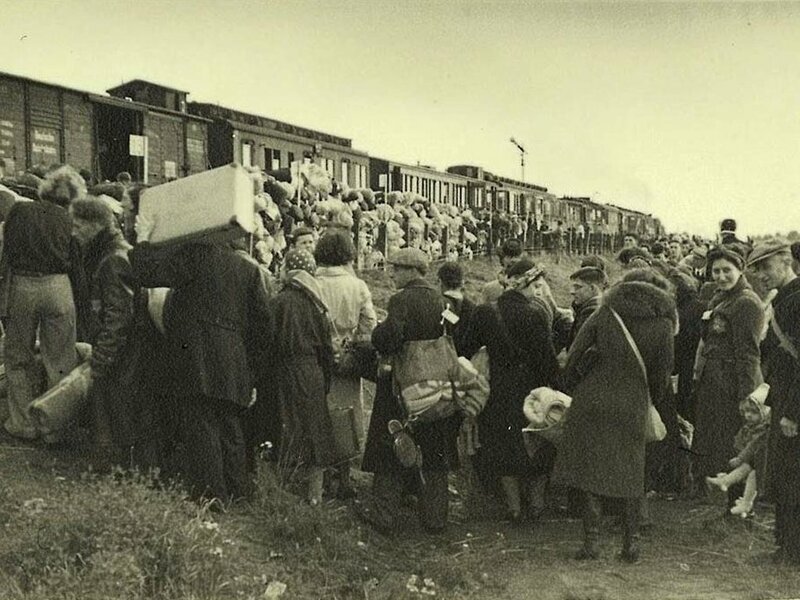 Many Dutch people were forced to leave their homes because of the acts of war. One of the evacuated cities was Breda, where fierce fighting was expected. Tens of thousands of people left the city on foot, packed with their belongings. During their evacuation, some people were killed as a result of the aerial combat over the area. As the city fell more quickly than expected, its residents were able to return to an undamaged city. Others did not flee the war so much as they fled the Nazis, especially those who had fled Germany earlier: Jews and Nazi opponents. They feared persecution. Because of the fighting in the south of the Netherlands, many people tried to get to England by ship. Only some of the refugees managed to find a ship. Others faced an uncertain future. Rotterdam had been the scene of bitter fighting since the beginning of the attack, but the Germans had not succeeded in taking the city. And so, on 14 May 1940, German general Schmidt presented the Dutch command with an ultimatum. Unless Rotterdam surrendered that same afternoon, the city would be bombed. The negotiators in Rotterdam did not know that the military leadership in Berlin had other plans. Hermann Göring, leader of the Luftwaffe, meant to use terror bombing to force the country to surrender. Even before the ultimatum had expired, the German bombers appeared on the horizon. They dropped their bombs over the city centre. When the smoke cleared, 80,000 people had lost their homes and between 600 and 900 people had died. The Germans went on to threaten to bomb Utrecht as well. Aware of the hopelessness of the situation, the Netherlands surrendered. In a school building in Rijsoord, General Winkelman signed the capitulation agreement on 15 May. The defeat was hard on the Dutch military and civilians. At the same time, many Dutch people were also relieved that the tension had subsided. Things felt different for the Jewish population. They had the most to fear from the Nazis. Some of them had fled Germany in the 1930s, and now, they were being overtaken by the Nazis. In the months after the invasion, hundreds of Jews committed suicide. As the Netherlands had surrendered, the Germans installed a new administration on 29 May, headed by Reich Commissioner Arthur Seyss-Inquart, an Austrian Nazi. For the next five years, the Germans called the shots in the Netherlands. Why did the Netherlands lose the battle? Contrary to what some people think, the German invasion did not come as a complete surprise. The Netherlands was well prepared for war, but its neutralist policy was an obstacle. It made it impossible to cooperate with England and France on a proper defence strategy. Although the state of the Dutch army was not as poor as is sometimes claimed, the Dutch armaments were outdated and inadequate. Moreover, the Netherlands did not have the strong military tradition Germany did. Even so, the Dutch carried out a number of successful military actions. Unfortunately, the army command often lacked the overview and so failed to turn small successes into big victories. By the summer of 1940, almost all of Western Europe was under German control. The surrounding countries either stayed out of the war or were German allies. Only England was still free, but it seemed inconceivable that the British would be able to liberate Europe in the short term. 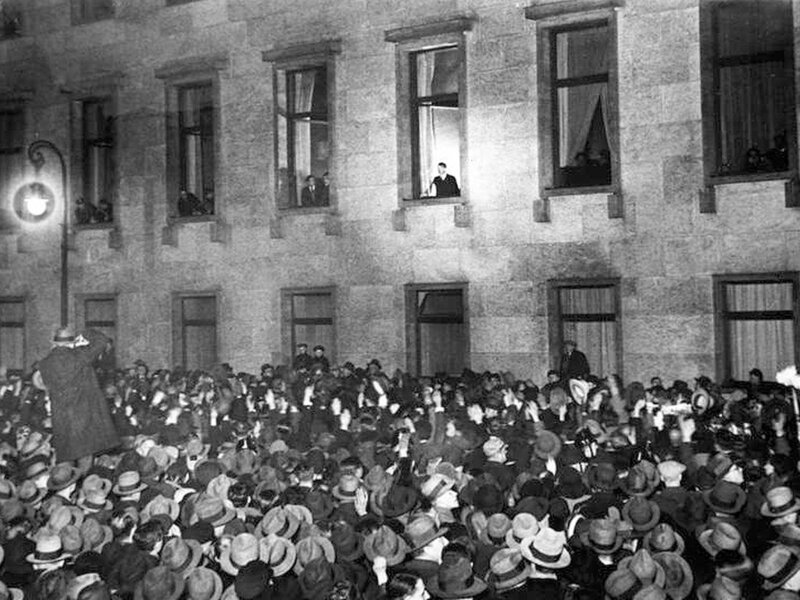 Adolf Hitler visits Paris on 23 June 1940, after the city has fallen into German hands. 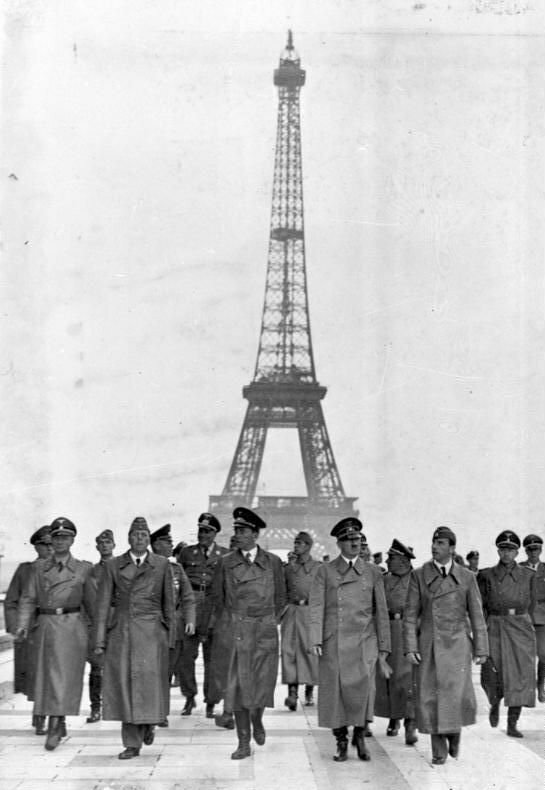 Here, Hitler and his entourage walk past the Eiffel Tower. Collection: Das Bundesarchiv / photographer: Heinrich Hoffmann. Source: Wikimedia Commons. Licence: CC BY SA 3.0 DE. Amersfoort, Herman & Kamphuis, Piet (eds. ), Mei 1940: De strijd op Nederlands grondgebied (Amsterdam: Boom, 2012, 4th revised edition).